SAFActive 78 high-linoleic safflower oil, water, xylitol, glycerine, gum arabic, natural flavors, vegetable juice, citric acid, xantham gum, guar gum, sorbic acid, vitamin E (as d-alpha tocopherol) and ascorbyl palmitate. Take 1 Tbsp. twice daily before meals. Delicious by the spoonful or mixed into cold beverages, shakes or yogurt. For best results, take for a minimum of 16 weeks and use in conjunction with regular exercise and a diet free of high-glycemic refined carbohydrates and trans fats. Water, SAFActive78™ high-linoleic safflower oil, xylitol, glycerol, gum arabic, vegeatable and fruit color, natural flavors, beta carotene, guar gum, xanthan gum, citric acid, malic acid, sorbic acid, vitamin E (as d-alpha tocopherol), ascorbyl palmitate. Shake well. Take 1 tbsp twice daily before meals. Refrigerate after opening. Those with sensitive digestive systems can take ½ tbsp four times daily with meals and at bedtime. Delicious by the spoonful or mixed into cold beverage, shakes or yogurt. For best results, take for a minimum of 16 weeks. Water, SAFActive78™ high-linoleic safflower oil, xylitol, glycerol, gum arabic, natural flavors, beta carotene, guar gum, xanthan gum, citric acid, malic acid, sorbic acid, vitamin E (as d-alpha tocopherol), ascorbyl palmitate. Delicious creamy liquid to help combat fat; great to add to yogurt, smoothies, protein shakes! 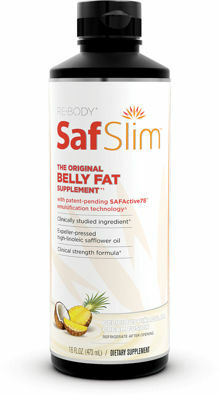 † SafSlim is to be used in conjunction with a reduced-calorie diet and exercise program. Check with your healthcare practitioner before beginning a reduced-calorie diet and exercise program or before taking this product if you are pregnant, nursing, under a doctor's care or taking medication.